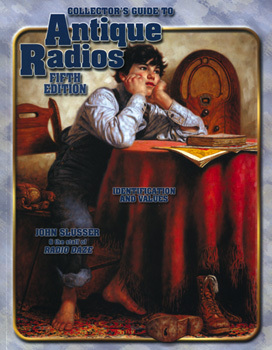 A hearty welcome and warm invitation for the lovers of the Golden Age of Radio is found in The Collector's Guide to Antique Radios written by John Slusser and the staff of Radio Daze. This identification and value guide is an invaluable information headquarters beginning with explanation of pricing, a review of terminology and keys to descriptive information. The ease of use is found with an extensive, alphabetical listing of antique radio companies followed by a clear and precise description of each item. Full-color, up close photos show clearly any unique detail. This book is a gem and a must have for radio clubs, collectors, enthusiasts and restorers.